On April 3, 2018, an International Repudiation Act is issued regarding Dzongsar Khyentse Rinpoche, who in August 2017 publicly stated that if the students were previously warned that it was a Vajrayana initiation then there would be nothing wrong with the crimes against humanity perpetrated by Sogyal Rinpoche. While it is recognized the fact that Dzongsar Khyentse Rinpoche states that Vajrayana Buddhism does not allow masters to sexually, emotionally and financially abuse their apprentices, the International Buddhist Ethics Committee makes this repudiation because, precisely, Dzongsar Khyentse Rinpoche has stated that after receiving an initiation it is a big mistake to analyze or criticize the guru. At the same time, Dzongsar Khyentse Rinpoche has also stated that the fundamental vision of Vajrayana cannot be modified just because it does not fit the minds of some liberal, puritanical, abrahamic and individualist activists. 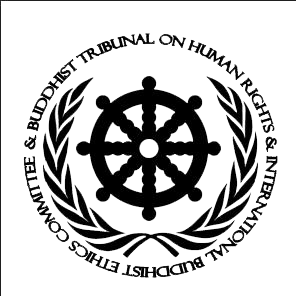 The International Buddhist Ethics Committee considers that this vision not only totally lacks active contemplation, compassionate wisdom and humanitarian ethics, but also contradicts Dalai Lama's position that if science proves that any belief of Buddhism is wrong, then Buddhism will have to change. Therefore, the legal science of human rights, together with the millenarian system of Buddhist Law, confirms that every illegal vision of Vajrayana must be changed. Thus, Dzongsar Khyentse Rinpoche's vision is completely rejected for stating that the criminal aspects of Vajrayana cannot be changed just to adapt it to the XXI century. The International Buddhist Ethics Committee declares Dzongsar Khyentse Rinpoche as a false Buddhist master, since he has stated that the crimes against humanity for which Sogyal Rinpoche is criticized and accused are based only on the projection of his critical students, even affirming that he cannot see anything wrong with what Sogyal Rinpoche did if the students were aware of the theory and practice of the Vajrayana to which they voluntarily entered. Unlike the complicit silence of the Dalai Lama, in this case, the public demonstrations of Dzongsar Khyentse Rinpoche constitute an act of active complicity with crimes against humanity, since they justify and support such ruthless acts such as Torture and Slavery, Fraud and Organized Crime, and Violation of Women's Rights. In fact, Dzongsar Khyentse Rinpoche has recognized that the Vajrayana possibly is a way contrary to the accepted laws and perhaps even criminal, which implies going beyond all kinds of values such as morality, the rule of law, accountability and transparency. But what this false Buddhist master is not recognizing is that Sogyal Rinpoche's actions not only violate the laws of the XXI century but are also a profound Violation of Buddhist Law. On the other hand, Dzongsar Khyentse Rinpoche lacks empathy, solidarity and spiritual love (Metta), questioning the victims of Sogyal Rinpoche for not examining their master before enrolling, even declaring that he cannot understand the reason why the victims waited so many years before saying something. This enormous lack of respect for the victims of Sogyal Rinpoche ignores the profound fact that RIGPA Sect systematically coerced and manipulated the students, washing their brains and making them believe that the Buddhist Spirituality allowed and endorsed the criminal and insane wisdom of Sogyal Rinpoche, covering up the fact that his actions were not the product of an enlightened master but were simply the actions of a sexual abuser and torturer. In fact, even Dzongsar Khyentse Rinpoche himself seems to agree with RIGPA's cover-up pattern, stating that he does not believe that legal punishment is the answer to solving the problem. Obviously, if Vajrayana Buddhism is Ole Nydahl's Islamophobia, if it is Lama Lobzang's Violation of the Buddhist Law, if it is Sogyal Rinpoche's Crimes against humanity, and if it is the Dalai Lama Tenzin Gyatso's Complicit Silence, then undoubtedly the current situation represents the starting point of the way toward the decline and death of Vajrayana Buddhism. The maximum proof of this terrible fact is the words of Dzongsar Khyentse Rinpoche for whom Islamophobia, the Violation of Buddhist Law, Crimes against humanity, and complicit silence, do not constitute the degeneration of Buddhist Spirituality, because for this false master the great deterioration or threat faced by Buddhism would be the Western promotion of Mindfulness and a version of the Buddhadharma without reincarnation, which has the potential to destroy Buddhism and to be the devil incarnated. This kind of essentially illusory and misleading ideas ignores that the only thing that can destroy Tibetan Buddhism is the Islamophobia of Ole Nydahl, the indifference towards genocide of Lama Lobzang, and the Crimes against humanity of Sogyal Rinpoche. Even the Dalai Lama's terrible complicit silence in the face of these facts totally delegitimizes Tibetan Buddhism in front of the rest of society, destroying its legitimacy of ethical leadership in the world. Only the lack of compassionate wisdom (karuna-prajña) facing the suffering of others can destroy the Buddhist Spirituality. Precisely, the lack of empathy and solidarity is what has led Dzongsar Khyentse Rinpoche to affirm that Sogyal Rinpoche has contributed to the world and to Buddhism with many more benefits than harm.